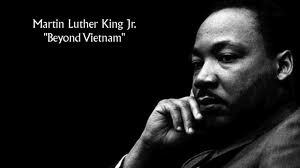 Dr. Martin Luther King, Jr. “Beyond Vietnam – A Time to Break Silence”, speech delivered April 4, 1967. The timing could not be closer. At precisely the same few days in current American affairs we (1) remember the universal call for brotherhood and non-violence so powerfully made by Dr. Martin Luther King Jr., and we (2) are told the Syrian government has ‘stepped over a red line’ drawn by our President, and we must respond with some kind of decisive force. “Troubling irony” barely expresses what we might feel hearing our President’s remembrance of King as he (our President) stands on one foot – with the other solidly planted in willingness to use killing force to take a stand against killing. Reverend King was not ‘just about’ domestic inequality. He taught of need to be all inclusive of all humanity. He spoke consistently with eloquent force and compassion on need for America to cease military-linked violence against people of other nations. The title of King’s speech announces his theme. The thinking that got us into Vietnam was gravely erroneous. What wisdom we gain from learning more about ourselves and learning more about ‘the enemy’ must be applied to future international relations. We must carry what we learn into our affairs “beyond Vietnam”. Yes, disturbing. He delivered the speech in 1967; it is now the 9th month of 2013. Forty-six years. Where have we been in that time? What have we done? Where are we going? What motivations have prompted us? I don’t mean our ‘said out loud’ goal motivations; clearly “prosperity and justice for all”, and “a peaceful world” are nowhere close. Where have we been, what have we done, where are we going. The heart breaks on behalf of many peoples – domestic and abroad. We know history and global politics are an entangled affair. Dr. King details some of this in his remarks specific to our war in Vietnam – how did we get there? As we listen to Dr. King reveal ‘not said out loud’ motivations that led us into Vietnam, we can ask more questions of ‘not said out loud’ history and motivations that have held us in the Middle East for so long. Who are the children and families, the neighbors in community, of Syria, of Iran, Iraq, Libya, Yemen, of the region generally – and of nearby Somalia, Afghanistan and even Pakistan? What is the shared human longing that these people experience with us? What is the history, and what are the motivations, that find us ‘there’ as a military force? Has violence of war – meeting violence with greater violence – ever really brought humanity closer to enduring peace and thriving community? InformationClearninghouse.info page includes the YouTube link to Dr. King’s “Beyond Vietnam” speech, includes the full text, and shares media response to Kings’ speech at the time – which was essentially to call King a traitor. My Best – To Absolutely Each and Every One of Us. — MaggieAnn. Note to any concerned about King’s “Christian” language – these are the teachings to which he devoted himself. If you listen carefully, you’ll discover King’s “Christianity” was in fact a commitment to universal wisdom, felt and followed by those ‘of faith’ as well as Humanists and others for whom ‘non-religious’ understandings are particularly important. See/hear also: “Lions and Lambs – A Call to ‘Extreme’ Idealism“, featuring a recording of Dr. King’s 23 minute sermon: “Why I Am Opposed To the War in Vietnam“. The sermon makes many of the same points as “Beyond Vietnam” but is addressed to a different audience, is less ‘academic’. Its message includes different language to evoke awareness of human suffering, and is equally powerful. Gallery | This entry was posted in Critical thinking, Geopolitics, Justice/Rights, Philosophy/Psychology/Human Nature, Social-Political, Universal family and tagged Beyond Vietnam speech, Dr. Martin Luther King, human rights, Iran, Middle East war, Syria. Bookmark the permalink. Maggie – stunning post. And such an important point – I noticed too how rapt and adoring everyone was over the MLK anniversary, but as you say, the rest of his life and the rest of his words were totally ignored. And in fact, his attention to Vietnam and to the poor had a serious impact on the country. But since we have nothing to brag about on those two issues, we must remain silent. Remaining silent is probably a good idea … I seem to have some trouble on that! Thank you for your appreciation of this post! I’m pretty sure one key reason for wide-spread objection to bombing Syria is linked to a thought, “we need to attend to our troubles at home”. I hope part of that thought includes addressing poverty, funding issues in public schools, deteriorating infrastructure, and other community need issues! So do I. By now, maybe people are starting to notice the deterioration of our infrastructure and our dismal education and health outcomes.